Find hotel near Centro Cultural Banco Do .. The Centro Cultural Banco do Brazil located across four Brazilian cities is among the most visited museum organisations in the world, with 74 million visitors annually. Like the other branches, this centre’s aim is to promote creation and exhibition of art over its 12000 metre square floor space. These arts cover theatre, cinema, music and design. Additionally, the centre also hosts classes and workshops through interactive exhibits. There is a conference space. Programmes and exhibits are produced regularly, and cheaply. After all, the point is to make art accessible. The centre is housed in a beautiful neo-classical and art deco building from the 1920s. Check attraction website for upcoming programmes. Prices vary widely across programmes, exhibitions and shows. Check attraction website. However, very frequently, exhibitions are free. 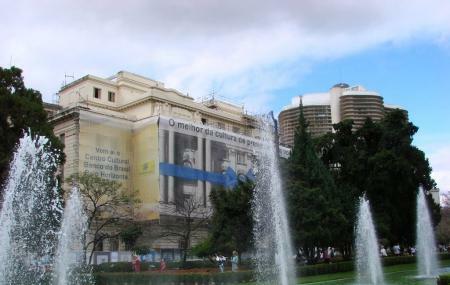 How popular is Centro Cultural Banco Do Brasil Belo Horizonte? People normally club together Praca Da Liberdade and Memorial Minas Gerais Vale while planning their visit to Centro Cultural Banco Do Brasil Belo Horizonte. Beautiful building staff well trained. Highly recommended for exhibitions. Bank of Brazil Cultural Centers are a haven in all capitals you find them,: São Paulo and particularly Brasília with its big backgarden area are splendid. Belo Horizonte CCBB is smaller but the venue offers a first class art attractions. Also the covered patio has created a great area that resemble a nave. Sit and have a coffee or enjoy a happy hour with live music. Then see a play that you won't regret and will help you to meet new very interesting people and brush up your Portuguese. Beautiful cultural center, with a book shop, a cafe and a restaurant hidden inside. A must go. beautiful historic building, friendly staff and great exhibitions and cultural activites. restaurant on the patio is amazing. wheechair accessible too. What a great place! Arts, bar and entertainment. Love it.